I don't think that it matters that I've just lost an hour, I've gained a track. The best thing to do with it now it to leave it alone for a week and go back to it with fresh ears. All of the main elements are there, the blocks that hold the track together, but it's far from finished. Next weekend I'll do a rough arrangement and export a copy. 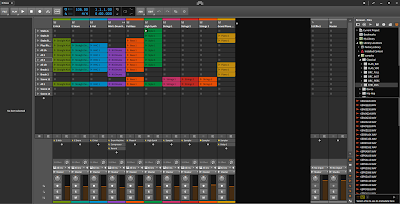 That'll be a backing track to listen to so that if I get any ideas I can subtract or add other elements. With all the pieces in place I'll leave it alone again and work on other tracks. At some point I'll mix it all properly and drop it into a folder. When that folder has a few tracks in I'll master them all and release an EP. I find it fairly easy to write tracks. The track above was started my me experimenting with a synth. I found a great bass sound and played until a riff emerged. The rest of the track has been built around the bassline. Sometimes it's a chord sequence. I suppose it's 50/50 when starting a new track. Bass or chords, the starting point is one or the other. So far I'm enjoying using Bitwig Studio a lot. As far as Linux DAW's go it has to be the best and a suitable replacement for FL Studio.